A chromatic jigsaw puzzle perfect for the CMYK connoisseur. Apologies, ROY G. BIV. Paris-based artist Clemens Habicht is aiming well beyond the shades of the rainbow with his aptly named 1000 Colors Puzzle. Perfect for the CMYK connoisseur, each of the thousand pigmented jigsaw pieces represents an individual hue. Players have to rely on an intuitive sense of color rather than image details to complete the chromatic challenge—a process Clemens calls "therapeutic." 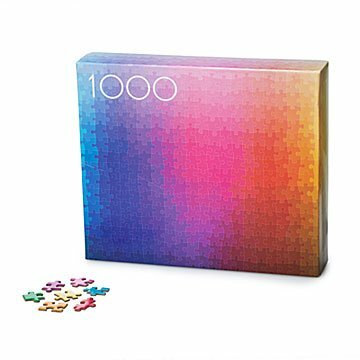 Whether players find it relaxing or stimulating, we can vouch for 1000 Colors' popularity—during its first run, design fiends scooped up every last puzzle within 72 hours. Made in China. Clemens Habicht doesn’t fit the mold of the classic toy maker. Based in Paris, he heads an art gallery and directs music videos in addition to his work as a graphic designer and illustrator. Yet despite his amped-up work schedule, Habicht may be best known for creating a delightful leisure-time activity: 1000 Colors, a picture-less jigsaw puzzle that eschews imagery and features only shades on the CMYK color spectrum. During its first run, design fiends scooped up every last puzzle in 72 hours. This puzzle was the perfect gift for my brother-in-law, who is difficult to shop for. It's unique and challenging, and looks absolutely stunning. Family puzzle, kids are 19 and 17. While the puzzle looks like it might be complicated, it was rather easy for our family. Simply sorted the colors. This was the first puzzle we have worked on as a family. The puzzle looks awesome when together. It was a bit expensive compared to other 1000 pieces and we did think it would take longer but no one regrets the family time we had. I bought this as a gift for myself and for our family. We are big puzzle family, and I am always looking for the next 'fun' puzzle to have out on the table. This puzzle certainly is fun. Both my daughter and husband are graphic artists and they love the color theory. It goes together pretty quickly, but it is hard to do in low light. My only comment is that the pieces are thin and the knobs can bend easily and that gives me concern because we do our puzzles over and over through the years. And for that reason, I feel it is overpriced for the quality. It's very unique and special compared to regular puzzles. She received this as a Christmas present. Loved the colors and challenge of the puzzle. I thought this puzzle would be more difficult than it was. My thought was that with each piece being a different color it would be hard to put together. But for me, each piece being a different color made it easy. I thought I would have days into a puzzle not 6 hours. But, it was fun and I will put it together and take it apart many times. This puzzle is so challenging.